Part of the mission of the RB Historical Society is to provide education about the history of Rancho Bernardo and surrounding areas. Two ways that we fulfill that educational mission are the monthly Speakers Series and our youth outreach program, the Kumeyaay Trunk Show. Our monthly Speakers Series, coordinated by Vincent Rossi, is held on the second Saturday of the month at 11am in the RB History Museum. It features fabulous speakers showcasing a wide range of topics. Many talks are videotaped and made available online via our YouTube Page for those who could not attend the live presentation. Our educational outreach program for young people has been a great success over the years. The Kumeyaay Trunk Show, presented by Shelley Charlesworth is the latest version. The goal of this program is to educate youngsters about the lives and culture of the original inhabitants of the area, thus inspiring a love of local history in a new generation. Fred Gahm and Reanell Hooten conducted a one-hour presentation, discussion of our timeline, games and short tour of the winery for Tiger Den 2 from Pack 681 of Rancho Bernardo. Lorraine displayed many wonderful artifacts that were used during the Native American period. 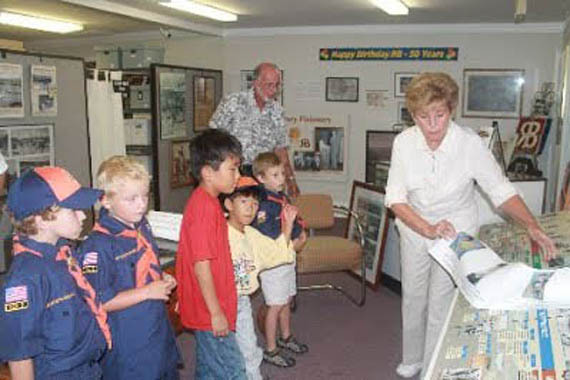 The Cub Scout leader, Julie Golich said RB Historical Society Museum is a treasure for the community. 1st Grade Cub Scouts from Westwood Elementary School enjoyed a tour from Lorraine Kai of our history museum and many artifacts on display! 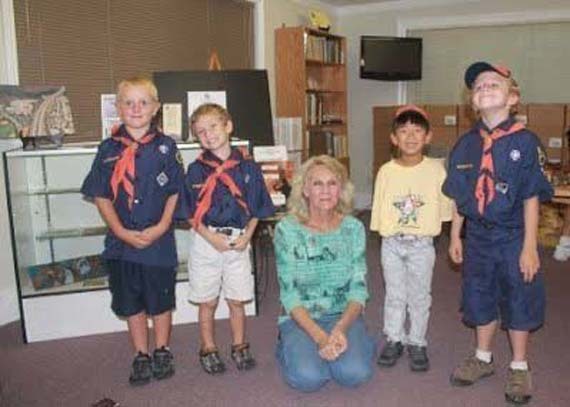 On December 15, 2012 Cub Scout leader Steve George brought his Pack 627 Den 8 from Rancho Bernardo to our museum eager to learn and full of questions about the history of the area. Following a delightful presentation segment, we toured the grounds where the children got to see farm equipment and buggies used in Rancho Bernardo. It was an exciting morning.